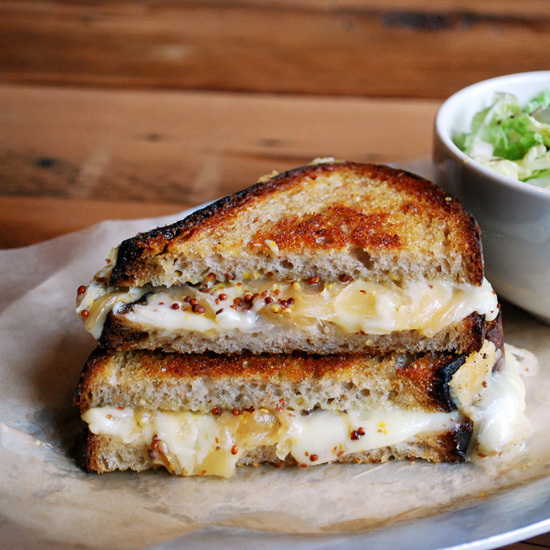 Forget about basic cheddar on white: these 22 restaurants are taking grilled cheese to a whole new level. 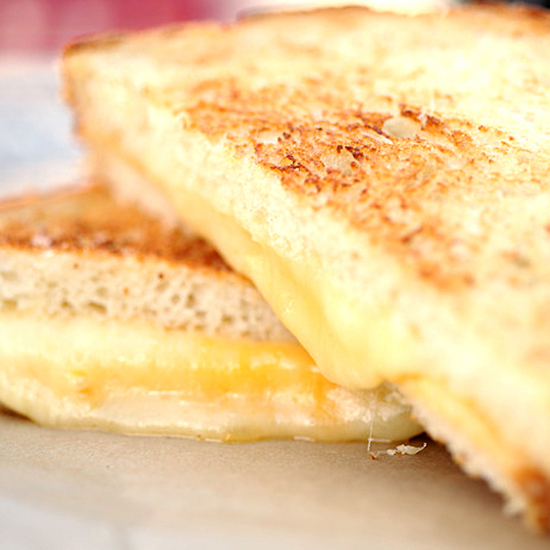 We have collected the best grilled cheese sandwiches from across the country, from The American Grilled Cheese Kitchen in San Francisco to Bouchon Bakery in New York City. 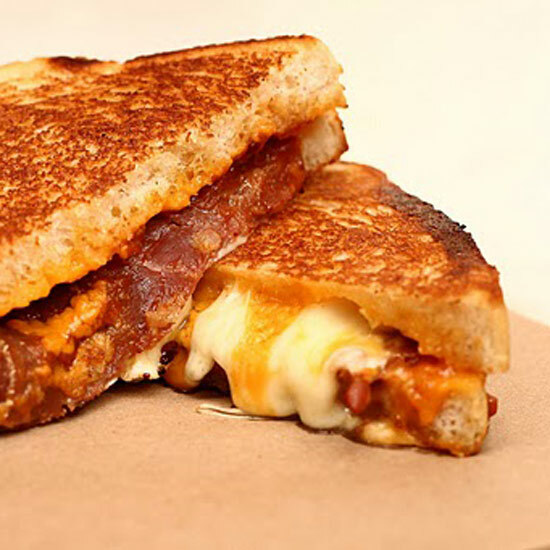 These grilled cheese purveyors are offering and exciting twist to the old classic. Be sure to try one of these the next time you’re in town. Heidi Gibson was an engineer with degrees from MIT. Then she won the national Grilled Cheese Invitational and opened this shop in the city's multimedia gulch. 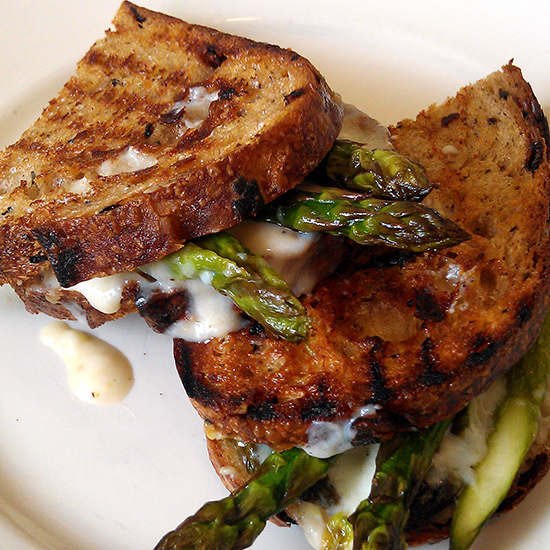 Tech geeks come for well-constructed sandwiches like the Mousetrap, with on artisanal sourdough. Graham Elliot Bowles is known for playful cuisine at Graham Elliot, and the sandwiches at his take-out joint, , are equally inventive. 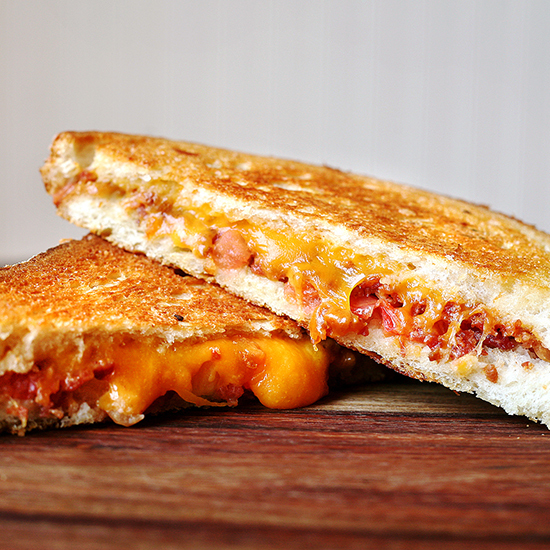 The grilled cheese on sliced Pullman loaf features Wisconsin cheddar, prosciutto, tomato marmalade and cheese curds, which, when melted, add an extra soft, gooey effect. .
With respect to Boston baseball (and Fenway Park's famed left-field wall "The Green Monster"), Roxy's offers the , with guacamole and bacon. 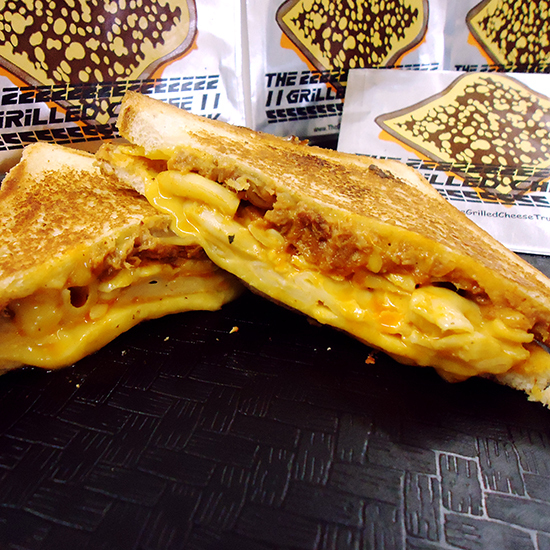 Here, too, mac and cheese is considered a sandwich filling for the Mac & Chorizo. In an ingenious twist, Roxy's brushes mayonnaise on the outside of sandwiches, rather than butter, before slapping them on the griddle. 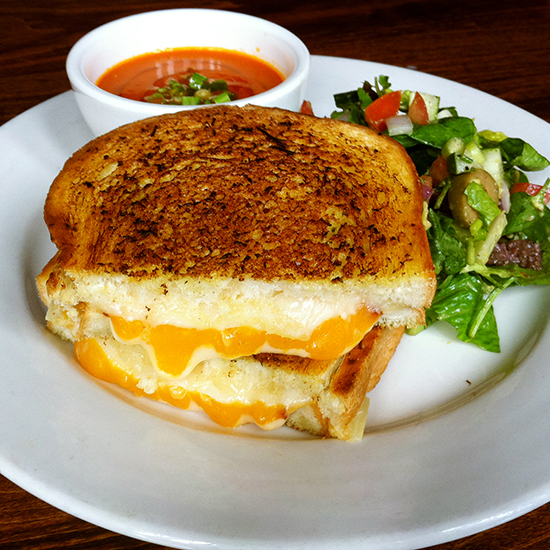 Chef-owner Annie Miler got so excited about her 10th Annual Celebration of Grilled Cheese Month this past April, she offered 10 variations each week. 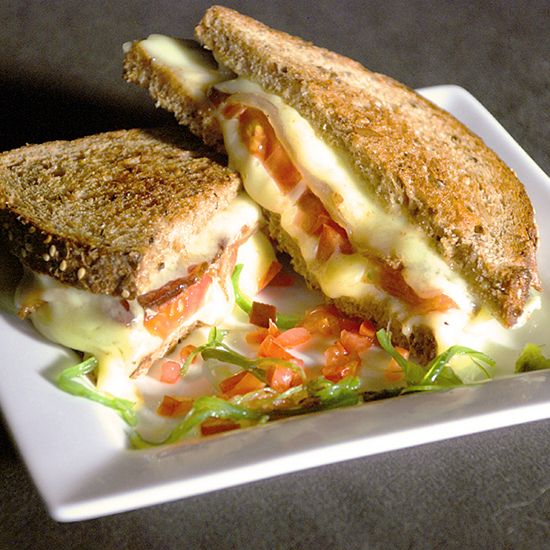 A year-round favorite: extra-sharp white Tillamook cheddar on country white with bacon or roasted cherry tomatoes. This Pike Place Market fixture just expanded to New York with a . 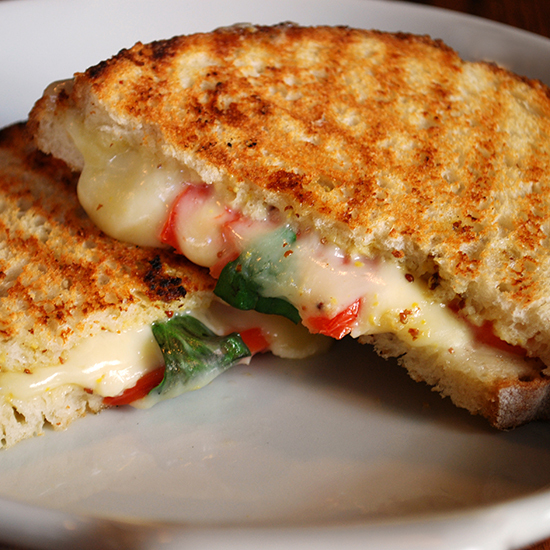 Each location grills its signature Flagship cheese—a slightly nutty blend of cheddar and Gruyère cultures—with fillings like tomato and basil. Each location also uses local bread: In Seattle, it's from Grand Central Bakery; Harlem nonprofit Hot Bread Kitchen provides excellent loaves in NYC. This mini-chain now has . Regional flavor comes through in a signature Crabby Melt with Jack cheese on top of homemade "crabby dip." Among the current specials is the Hermanator, designed by NASCAR driver Kenny Wallace: provolone, turkey breast and pickles with honey-mustard sauce. Ever since Terrance Brennan met his first runny, robust Époisses in the early 1980s, he has dedicated himself to cooking with cheeses. During lunch at , the menu highlights several in sandwiches like The Big Cheese, featuring Fontina, Taleggio, Gruyère and Emmenthaler, and the chichi Frenchie with Brie, mushrooms and black truffles. At their , husband-and-wife team Chad Robertson and Elisabeth Prueitt use organic flour to bake extraordinary bread. 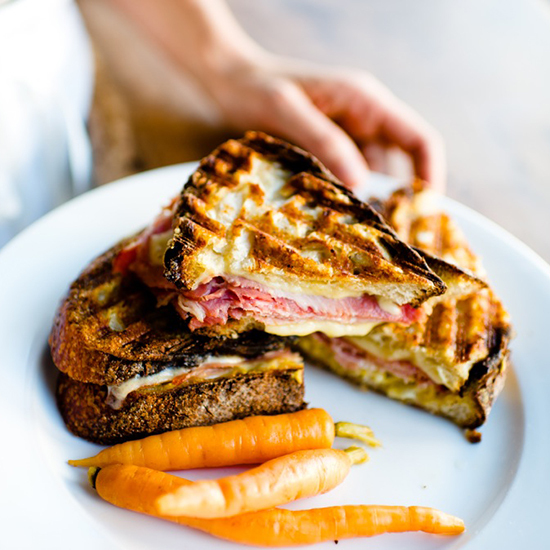 Generous slices of the homemade loaves upgrade luxe pressed sandwiches like melty Gruyère with ham, and Humboldt Fog goat cheese on walnut bread. In most places, macaroni and cheese would be served as a side dish with house-smoked BBQ pork. At , that's the basis for a Cheesy Mac and Rib Sandwich. 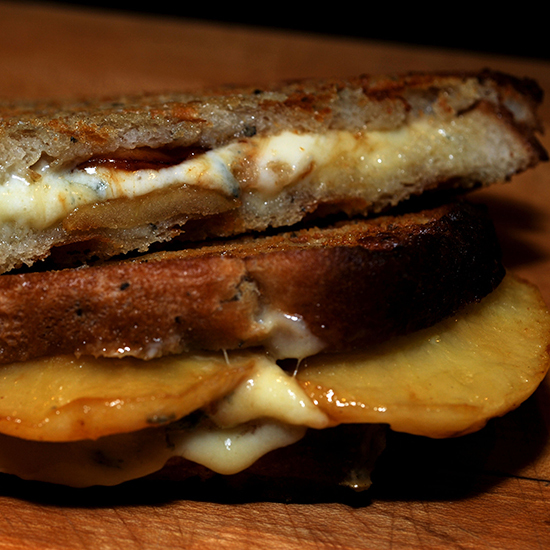 Likewise, the Brie Melt is an indulgent union of brie and smoked pork loin with peach preserves. This café takes inspiration from the amazing ethnic diversity of its Queens hometown. Sandwiches include the Greek-influenced feta with roasted red pepper spread; the with pickled and caramelized onions; and a global grilled Gouda with black bean hummus, guava jam and pickled jalapeños. 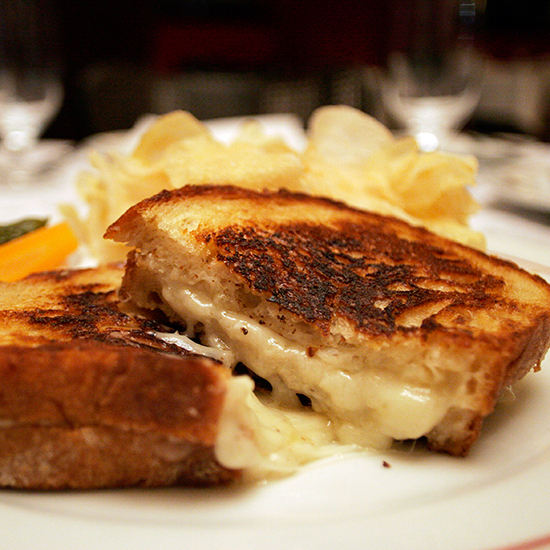 Thomas Keller's combines house pain au lait with a super-melty blend of Fontina and Gruyère cheeses. 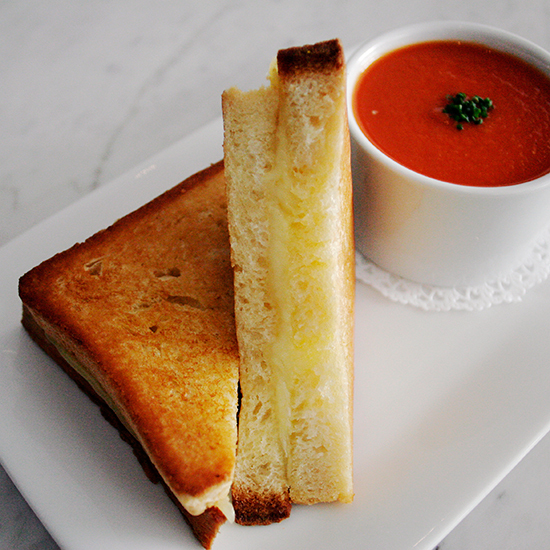 While both NYC locations (at Time Warner Center and Rockefeller Center) serve the comforting sandwich alone, it's great with Bouchon's vegan tomato soup to counter the buttery richness. To create a grilled cheese that holds its own on a menu with 13 beers on tap, chef Scott Schroeder starts with local Bakers Street white bread, adds Lancaster County smoked cheddar, sharp provolone, and American cheese, then coats the sandwich with garlic-herb butter before griddling it until dark and crispy. Befitting , Schroeder incorporates Pennsylvania's Yuengling lager in a side of tomato soup. Husband-and-wife owners Ihsan and Valerie Gurdal seek out the finest small-batch cheese producers in Europe and the US. 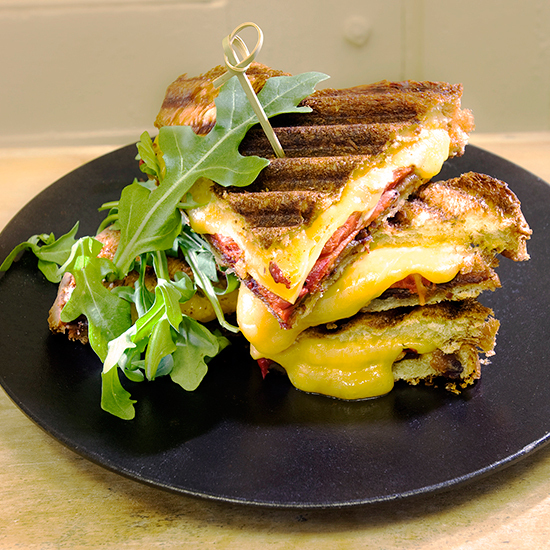 The daily menu stars cheese-focused panini like Anna's Big Jim, with ham, salami and cheddar or . During big holiday shopping seasons like Thanksgiving and Christmas, other sandwich whims might include a Comte Les Granges with Italian cipollini onion preserves sandwiched between Pain D'Avignon white bread. has been pushing dairy since launching as a vendor at New York's artisanal-food-biz incubator Brooklyn Flea. 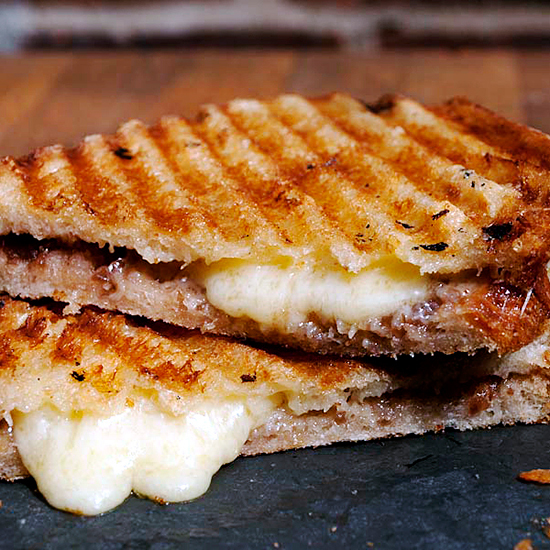 Buttery grilled cheeses come on breads from the city's best bakeries, like Sullivan Street and Balthazar. Though there are no bottles of milk for sale, various milk shakes blend great ingredients like vanilla bean ice cream, dark chocolate and seasonal fruits. During daily happy-hour windows (including 10 p.m. to 2 a.m. nightly), and live-music venue runs a "Recess" menu. 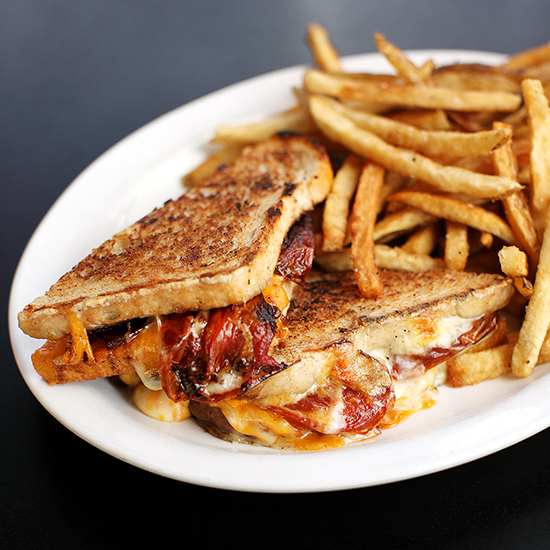 The dish that recalls childhood most is a Fontina grilled cheese with bacon and tomato—on adult-worthy multigrain. One of mkgallery's nominees for People's Best New Chef, Andrew Curren applies fine-dining skills gleaned from top kitchens like Barbuto to the 24-hour diner staples here. 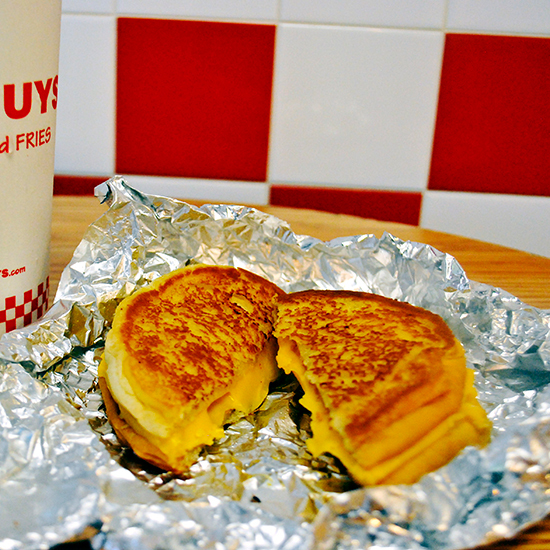 His grilled cheese comes on . Dairy devotees finish with pair it with an amazing roasted banana–and–brown sugar milk shake. The keeps its menu spare with messy burgers and fries cooked in peanut oil. 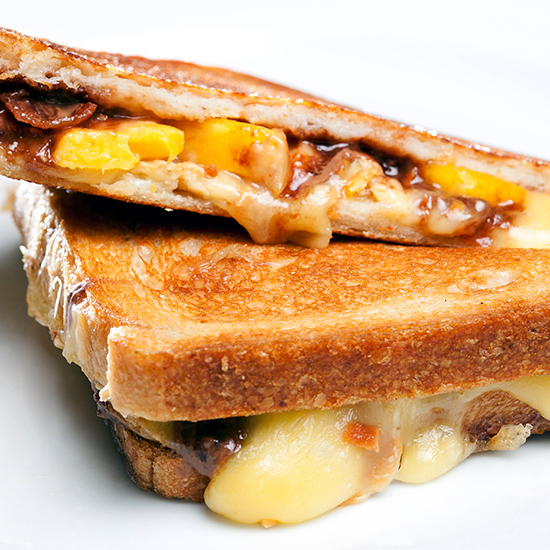 As an outlier, its grilled cheese makes innovative use of ingredients on hand. A hamburger bun is inverted, so it's flat-side out, coated with mayo, and stuffed with Kraft American cheese before getting smashed until golden and seriously melty away from the burgers on the bread-only griddle (so it's still vegetarian). This bakes wonderful artisanal breads daily, including the focaccia used in a pressed sandwich that combines Fontina, mozzarella, provolone and a salty swipe of olive tapenade. 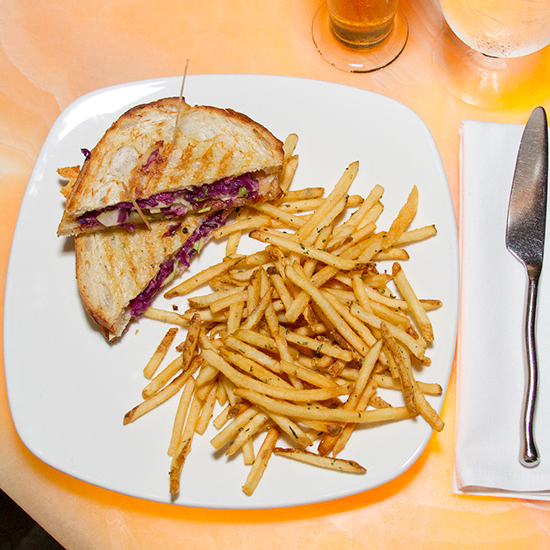 Megawatt Spanish chef José Andrés takes a haute approach to grilled cheese during lunch at his . 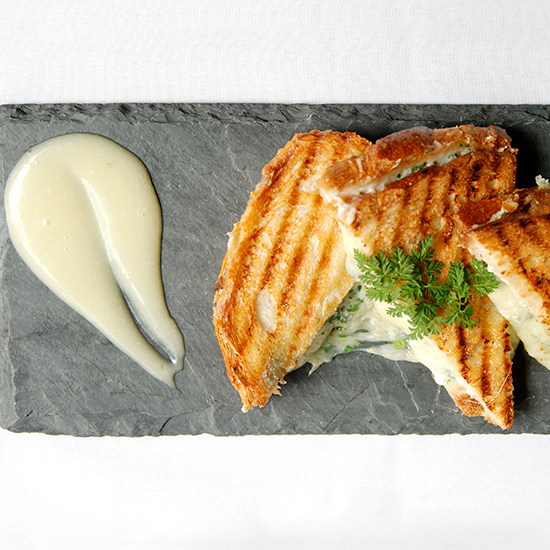 The sandwich features a lavish mix of imported Manchego, Murcia, Valdeón, goat cheese and truffle oil, plus beautiful golden grill marks. Iron Chef Michael Symon's serves a lunch-only grilled cheese made with Mexican Chihuahua cheese, which is so good for melting that it's often used in queso fundido (spiced-up fondue). Here, Symon adds roasted red pepper, grilled red onion and arugula. Along the route to some of California's most breathtaking state parks, , beautiful omelets and wood-fired breads provide a thrilling break from burritos and trail mix. 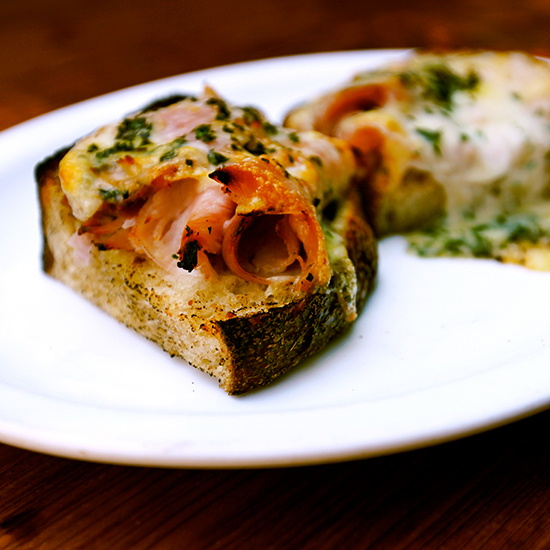 The grilled Gruyère and Niman Ranch ham sandwich, on their crusty bread slices, is open-face and delicious. 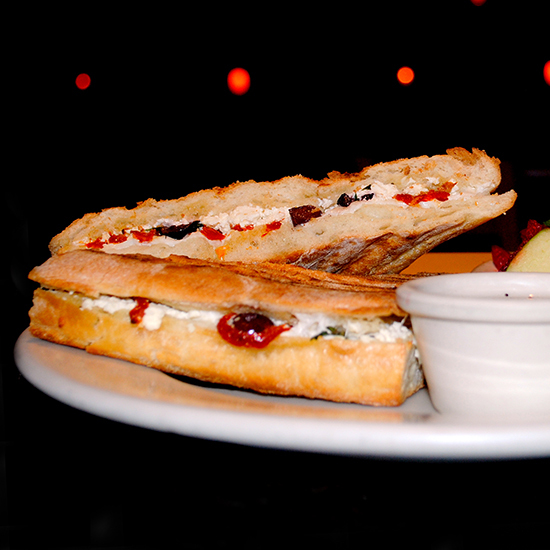 A , the grilled cheese at this Mediterranean-inspired American is non-traditional, with fresh mozzarella and feta cheeses on ciabatta, plus sun-dried tomatoes, Kalamata olives and basil. Был найден мной классный web-сайт на тематику https://unc-mps.com.ua.